Kuznets Prize of the Journal of Population Economics given at the #ASSA2019 Reception of IESR in Atlanta. The awarded study receiving the Kuznets Prize shows that a rise in the disease risk increases the total fertility rate and the number of surviving children. This has important policy implications. 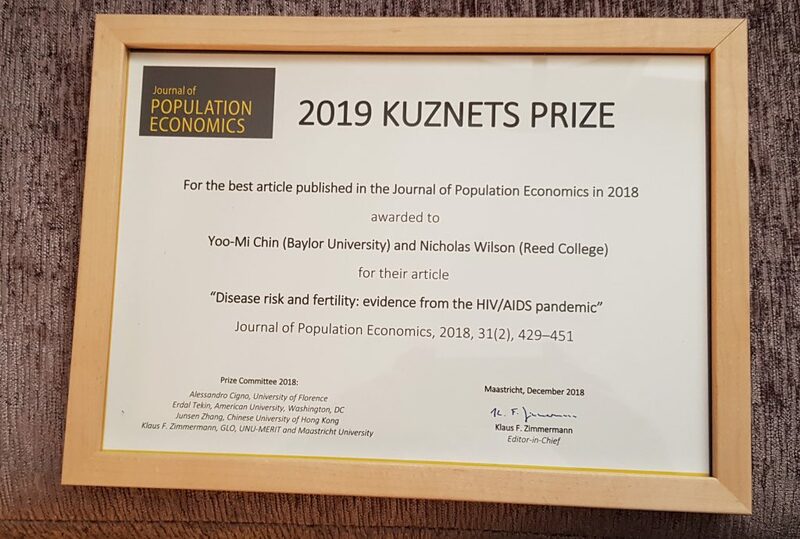 The Kuznets Prize Paper of the Journal of Population Economics in a particular year is selected by the Editors of the Journal among the papers published in the previous year. Then the winners will be presented in a prize ceremony. This time, the winners remained confidential until January 4, 2019. 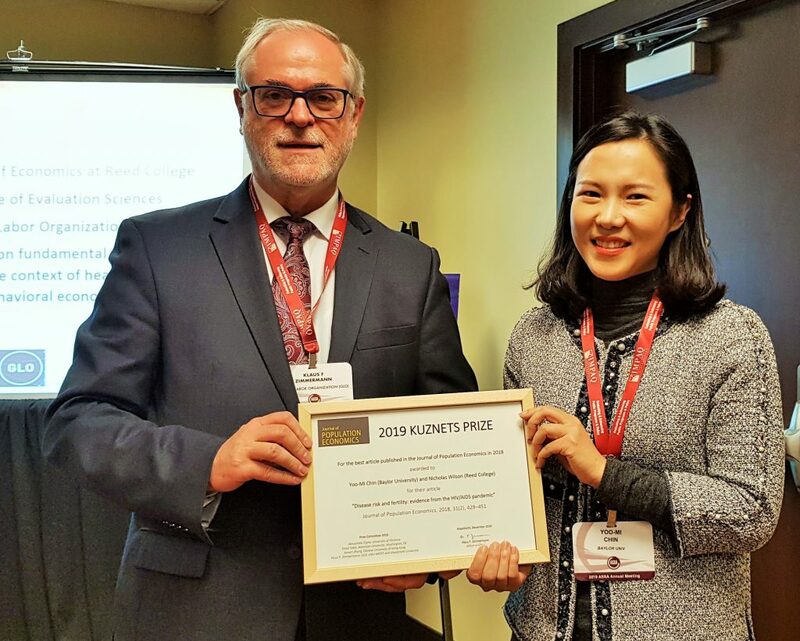 The prize committee for the 2019 award consisted out of Alessandro Cigno, Erdal Tekin, Junsen Zhang and Klaus F. Zimmermann selecting from the 2018 published articles they were in charge of as acting Editors. 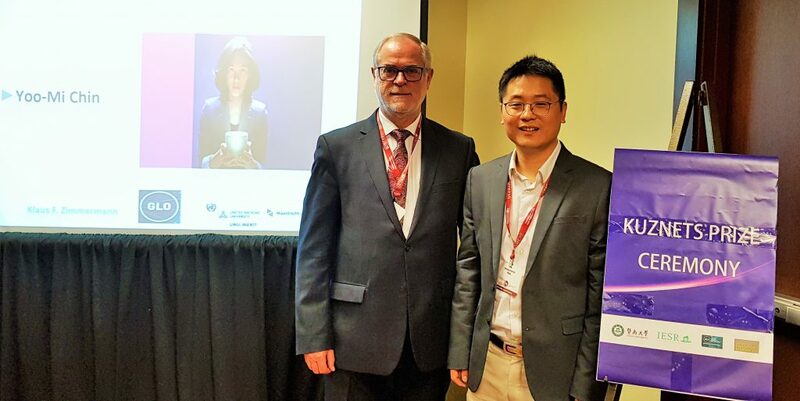 Dean Shuaizhang Feng, Head of the Institute for Economic and Social Research (IESR) of Jinan University, had invited the members of the Global Labor Organizations (GLO) and the Kuznets Prize Ceremony of the Journal of Population Economics as other ASSA 2019 participants to join the reception of the Institute. 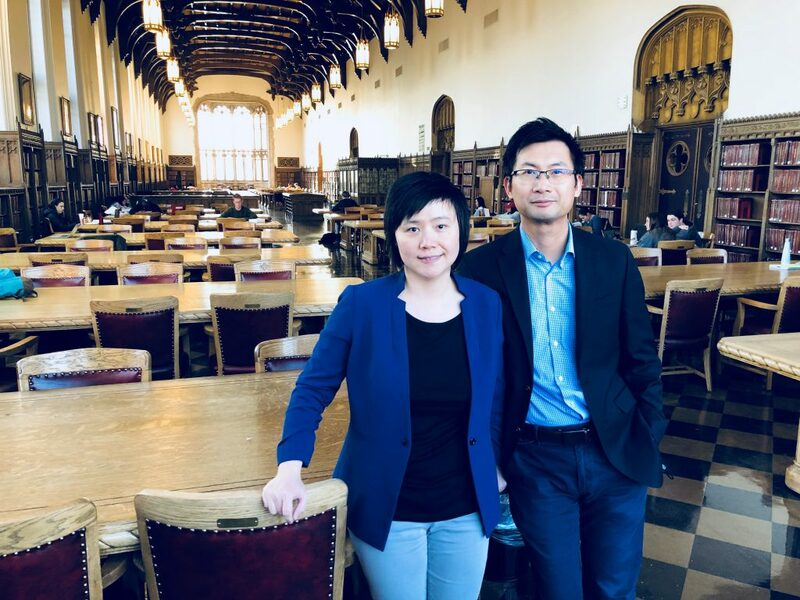 IESR and GLO are collaborating organizations, and Shuaizhang Feng is a GLO Fellow and Associate Editor of the Journal. 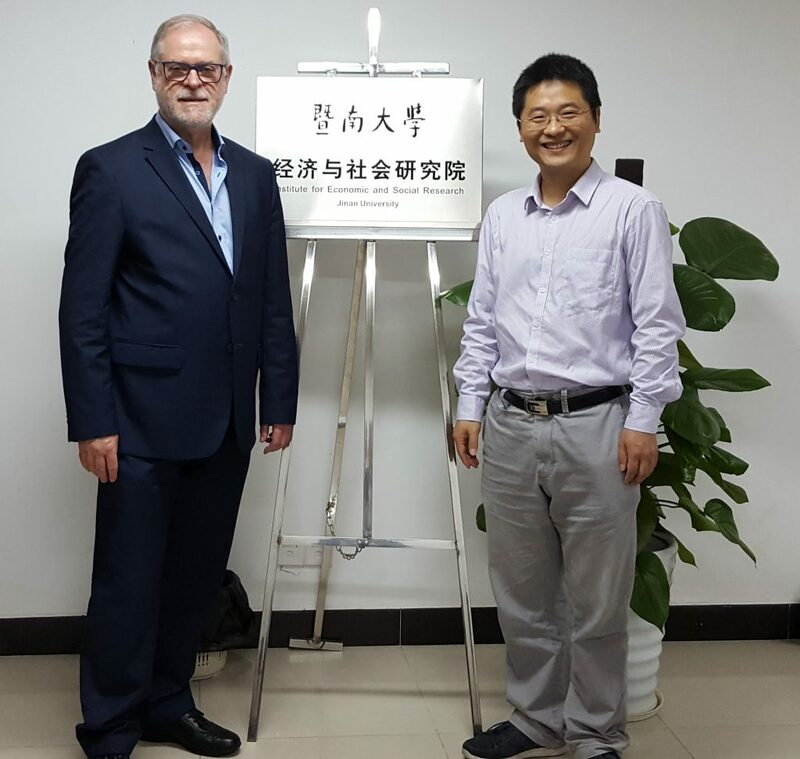 GLO President Zimmermann (UNU-MERIT & Maastricht University) and Editor-in-Chief of the Journal had visited Jinan University and IESR in March 2018 for a longer period and a GLO-IESR workshop. He had also presented the Journal in 2018 to various academic events in Beijing, Xiamen and Hongkong to strengthen the already strong contacts to the Chinese research community. A larger number of economists participated, including many Editorial Board Members of the Journal of Population Economics and Kuznets Prize winners of previous years. Shuaizhang Feng reported about the activities of IESR and the hiring interviews at the ASSA job market and explained the attractive research climate at the Institute. He also warmly welcomed the affiliates of GLO and the Journal of Population Economics. Klaus F. Zimmermann congratulated Feng for the successful development of IESR and the strong research climate and the attractive working conditions he had observed while visiting the Institute in 2018 and met with the very many strong and ambitious researchers. Knot yet: Minimum marriage age law, marriage delay, and earnings, Journal of Population Economics (2017), 30(3), pp. 771-804. Both authors had studied and graduated at Jinan University before they came to the United States. Le Wang expressed his gratitude for receiving the Kuznets Prize and explained how it created visibility for his work. Then the 2019 Kuznets Prize paper was announced. Studying the HIV/AIDS pandemic using national household survey data from 14 sub-Saharan African countries, it suggests that a rise in the disease risk increases the total fertility rate and the number of surviving children. This has important policy implications. Yoo-Mi Chin & Nicholas Wilson, Disease risk and fertility: evidence from the HIV/AIDS pandemic, Journal of Population Economics, 31 (2018), 429–451. Abstract: A fundamental question about human behavior is whether fertility responds to disease risk. The standard economic theory of household fertility decision-making generates ambiguous predictions, and the response has large implications for human welfare. We examine the fertility response to the HIV/AIDS pandemic using national household survey data from 14 sub-Saharan African countries. Instrumental variable (IV) estimates using distance to the origin of the pandemic suggest that HIV/AIDS has increased the total fertility rate (TFR) and the number of surviving children. These results rekindle the debate about the fertility response to disease risk, particularly the HIV/AIDS pandemic, and highlight the question of whether the HIV/AIDS pandemic has reduced GDP per capita. Yoo-Mi Chin is an Assistant Professor of Economics at Baylor University with a Ph.D. from Brown University. She is also a Fellow of the Global Labor Organization (GLO). Most of her research focuses on the analysis of domestic violence. She has published her previous work in the Journal of Applied Statistics, the Journal of Health Economics, and World Development, among other outlets. Prior to joining Baylor University, she was an Assistant Professor at the Missouri University of Science & Technology. Nicholas Wilson is a Fellow with the Office of Evaluation Sciences, an Associate Professor of Economics at Reed College and the Chair of the Department of Economics. He is also a Fellow of the Global Labor Organization (GLO). His research focuses on fundamental puzzles about human behavior in the context of health, development, and behavioral economics. Prior to joining Reed College, he was a Visiting Scholar at the University of California, Berkeley and an Assistant Professor of Economics at Williams College. He has published a larger number of papers in journals including the American Economic Review, Demography, Economics & Human Biology, Journal of Development Economics and Journal of Health Economics. Yoo-Mi Chin was present at the ceremony and happily took the prize. The large crowd of participants congratulated the prize winners and networked intensively within the remaining reception time. 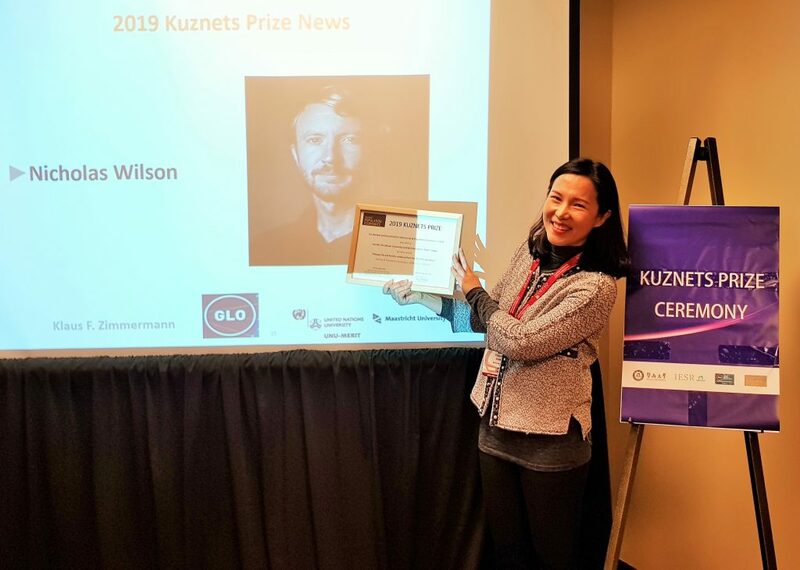 Those friends of the Journal of Population Economics and the Global Labor Organization (GLO) participating at the ASSA 2019 Atlanta conference are invited to the prominent Kuznets Prize ceremony. It takes part at the Reception of the Institute for Economic and Social Research (IESR), Jinan University, on Friday January 4, 2019, from 6pm to 8pm, at Hilton Atlanta 217. The ceremony will start at about 6.30 pm and will take about 15 minutes. The Editor-in-Chief of the Journal of Population Economics will announce some journal news including the 2019 prize winner(s). Then the award plate is given to the (still confidential) author(s). The 2018 Prize winner Le Wang will be also present; see an interview with him about the last prize paper. Those planning to attend the reception are invited to register with Jiayu Lin via email: iesr_job@126.com. The Kuznets Prize ceremony takes place on the invitation of Dean Shuaizhang Feng, Head of the Institute for Economic and Social Research (IESR), who is also a GLO Fellow. He will introduce the ceremony. The Editor-in-Chief of the Journal of Population Economics is also the President of the Global Labor Organization (GLO): Klaus F. Zimmermann (UNU-MERIT and Maastricht University). IESR has been an early institutional supporter of GLO.